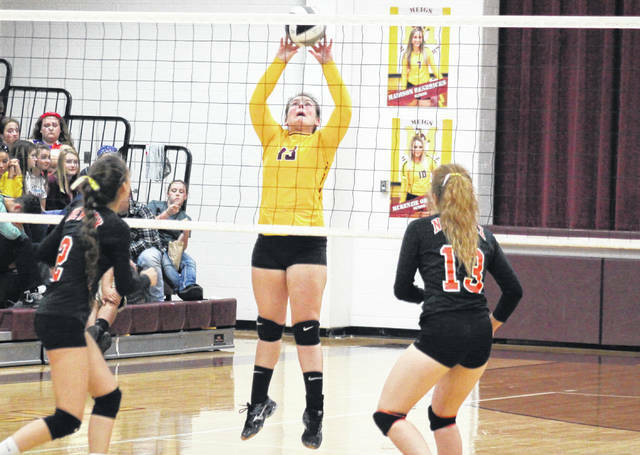 Meigs sophomore Saelym Larsen (center) hits the ball over the net during Lady Marauders’ 3-1 win against New Lexington on Tuesday in Rocksprings, Ohio. Meigs freshman Bre Lilly (right) passes the ball in front of sophomore teammate Maci Hood (6), during the Lady Marauders’ 3-1 win in the sectional semifinal on Tuesday in Rocksprings, Ohio. ROCKSPRINGS, Ohio — The Lady Marauders had one more chance to play in the comforts of home, and they certainly made the most of it. 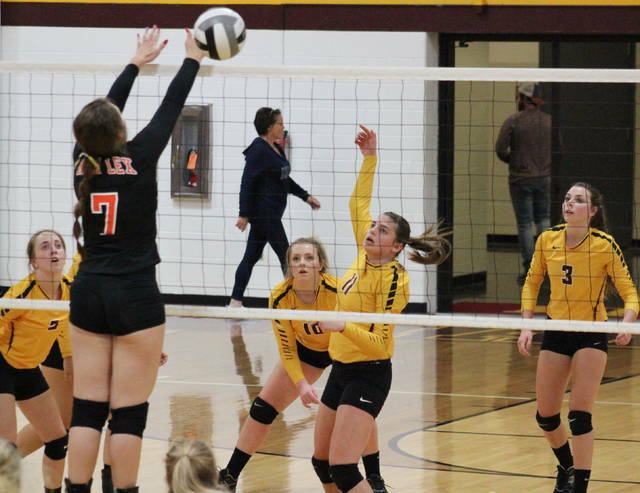 In the Division III sectional semifinal on Tuesday evening inside Larry R. Morrison Gymasium, the eighth-seeded Meigs volleyball team earned a 3-1 victory over ninth-seeded guest New Lexington, advancing to Saturday’s sectional final at Southeastern. The Lady Marauders (10-13) led initially in the opening game, but New Lexington (3-20) fought back, tying the game four times before finally taking the lead at 12-11. 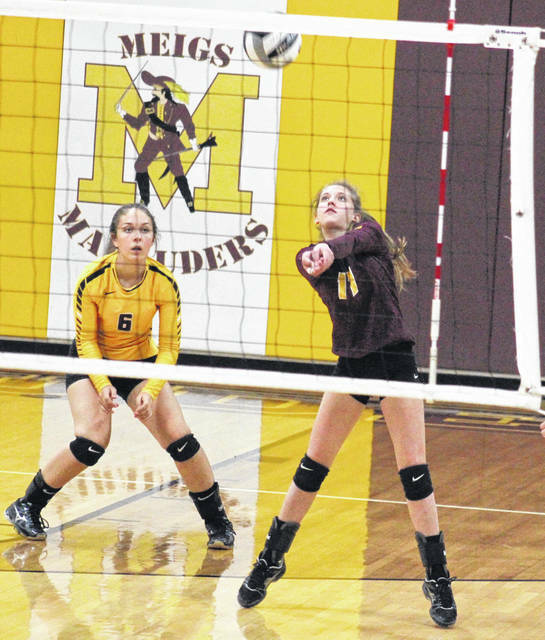 Meigs regained the edge at 15-14 and led the rest of the way to the 25-16 win. After four early ties in the second game, the Lady Panthers stretched their lead to 14-8. Meigs began chipping away at the deficit and finally tied the game at 24. MHS tied the game again at 25 and 26, but New Lexington held off the charge and evened the match with a 28-26 triumph. The guests claimed the first three points of the third game, but the Lady Marauders took the lead at 7-6 and never relinquished it on their way to a 25-13 win. The fourth game featured eight lead changes and 13 ties, the last of which came at 24-all. The Lady Marauders claimed the final two points on serves by freshman Hannah Durst, sealing the 26-24 win and the spot in the next round. The Lady Marauders committed just five serving errors in the win, while making 13 hitting errors. The Lady Marauders finished with a 56.1-to-44.4 advantage in side-out percentage, while NLHS claimed an 89-to-76 edge in digs. Marissa Noble led the MHS service attack with 16 points, including three aces. Kassidy Betzing earned 13 service points and two aces, Maddie Fields added 11 points, while Saelym Larsen chipped in with seven points and two aces. McKenzie Ohlinger had five points and one ace in the win, while Durst earned three points and one ace. At the net, Betzing led the Lady Marauders with 14 kills, followed by Maci Hood with eight. Durst had seven kills and a pair of blocks for the victors, while Fields recorded five kills and a team-best 34 assists. Noble earned three kills for the Maroon and Gold, while Ohlinger and Larsen added one kill apiece. 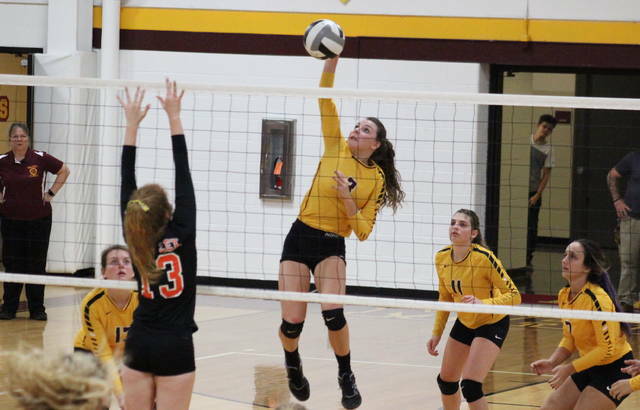 Betzing also led the Meigs’ defensive effort with 24 digs. Callie Fout led the New Lexington service attack with eight points, including one ace. Bailey Harris and Ashtyn Montgomery each had six service points, Riley Harris added five, Haylee West chipped in with three points and one ace, while Layona Davis earned one point. Montgomery and Riley Harris each had a dozen kills for the Orange and Black, with Montgomery also earning a block. West finished with eight kills, Bailey Harris added four, while Izzi Hill finished with three and Elaina Hartberger contributed one. Carrie Kallaus recorded a team-high 18 assists, while Davis had a team-best 29 digs. Next up for Meigs, top-seeded Southeastern will host the Lady Marauders in the sectional final on Saturday at 4 p.m.
“We have to watch film and we’ll see what we have to do to battle and win that game,” said King. The Lady Marauders will be going for their first sectional title since 2014, which was also the last time they competed in the Division III tournament.